In mid-March, my friend Bill and I decided to make a quick run down to the southern California deserts. 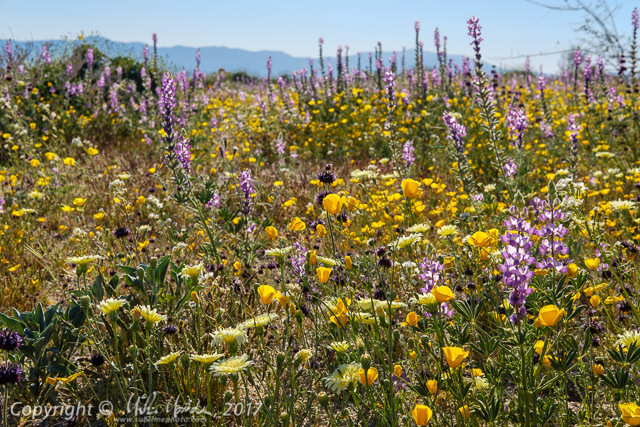 That region had received way above average rainfall and a wildflower "super-bloom" was fully in progress. Have a look at the above photo; normally that area of Joshua Tree National Park has rocky, sandy ground with a few sage-brushes dotting the slopes and maybe some tufts of drying grass. However back in March, as you can see, one could walk knee-deep in spots through carpets of blooming wildflowers! Unfortunately it was too early for the bloom in the higher parts of Joshua Tree NP, where all the cool rock formations and, of course, the Joshua trees are located, so the slopes near the south entrance were the only spots to really see any wildflowers. With only this one area in bloom, we decided to head down to Anza Borrego Desert State Park the next day, a fair bit further south and where we knew the wildflowers were already fully developed.